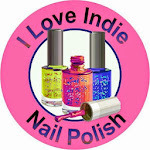 Today, I have some polishes to show you that really glow.. and have a little bite to them! 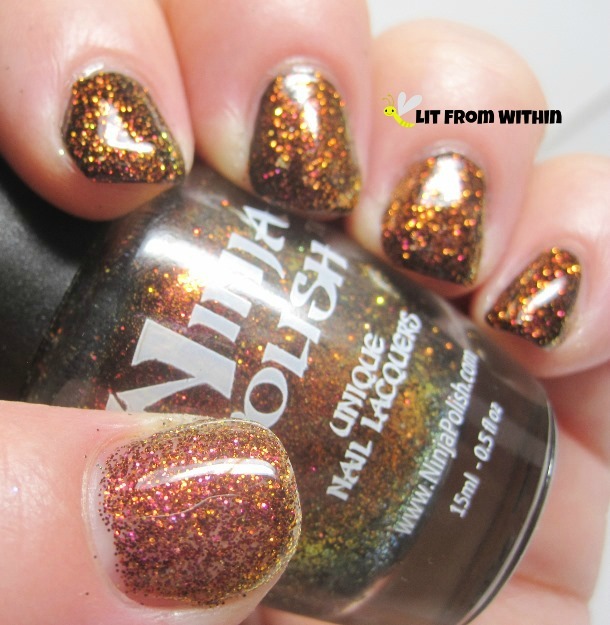 The aptly named Dragon collex from Ninja polish isn't for the shy. 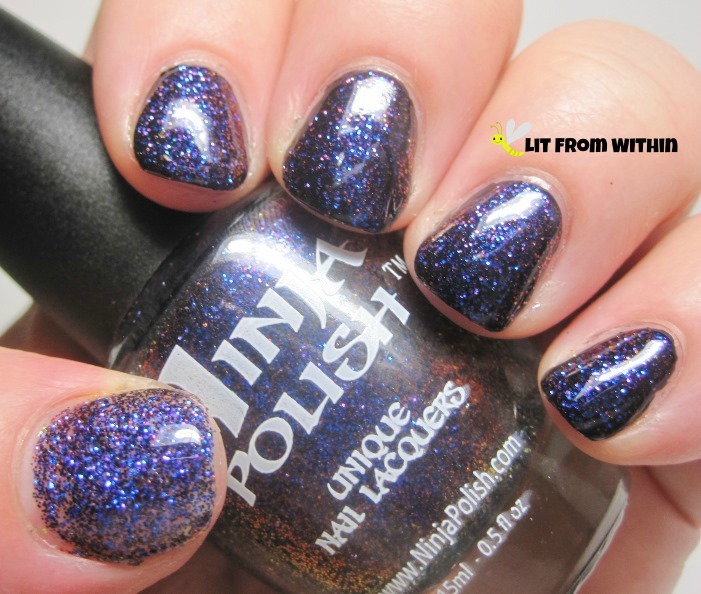 These polishes are flashy and gorgeous. In all the swatches, I have applied 2 coats of the glitter by itself on my thumb, and 1-2 coats of the glitter over OPI Black Onyx on the rest of my fingers. 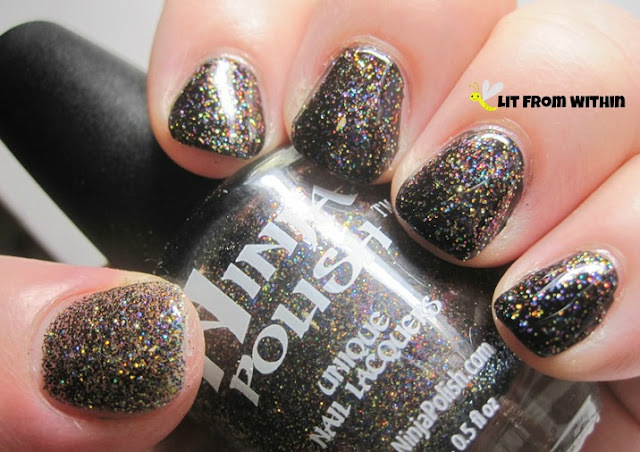 The glitter is opaque on its own, but the multichrome really gets an oomph from the black undies. 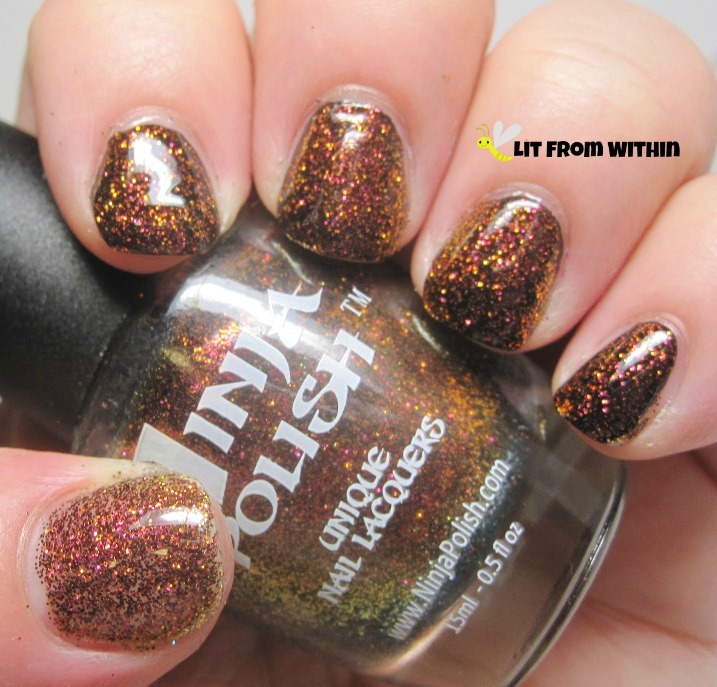 Basilisk was the polish I was least excited about, but ended up really liking. I thought, how many golden green polishes do I really need? I need this one! 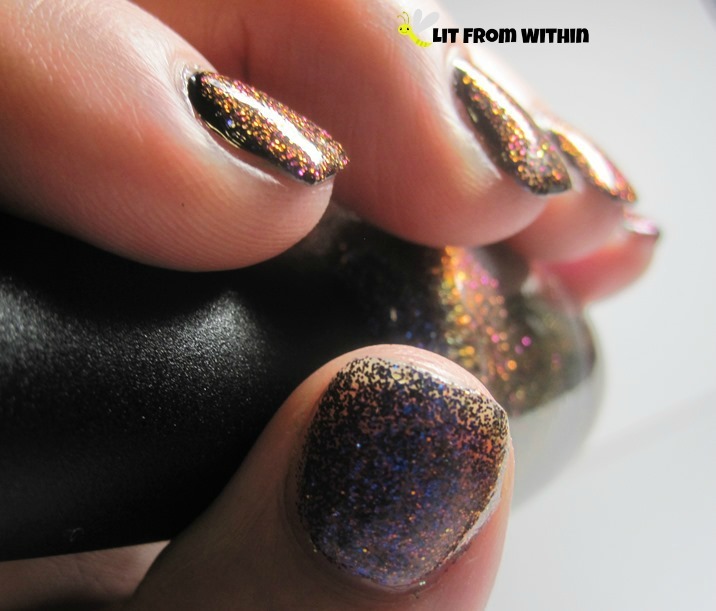 This polish is glitters like the scales of the mythical basilisk. Luckily, it won't turn anyone to stone. You may not believe that the next two pix are the SAME polish - Chameleon. Straight on, it's a lovely mix of purple and blue. You can see a hint of the golden red on the sides of the bottle, but it's nowhere on the nail, until you turn to the side, and then, BAM. Reddish/gold with green. A true chameleon color-changing polish! For me, Komodo is the star of this collex. 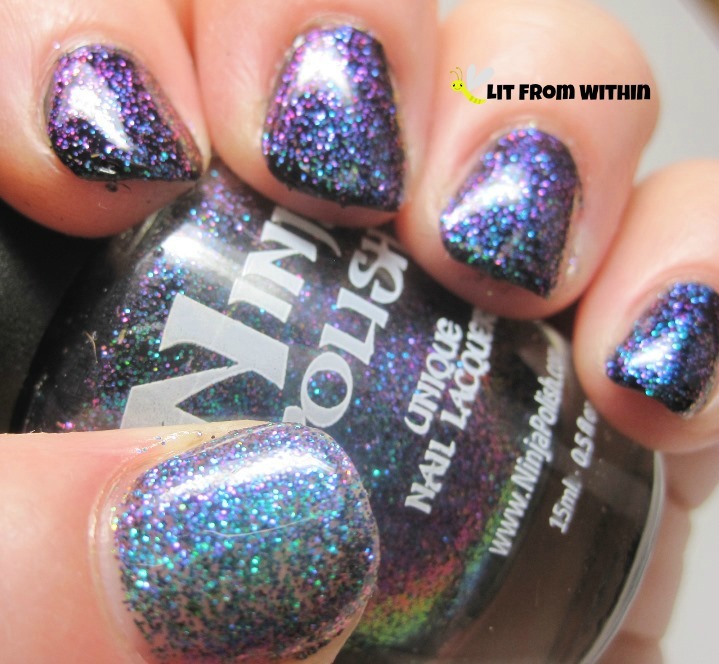 I absolutely love this combination of colors in a multichrome. The hot pink and gold just look amazing together. Even without undies, the pink is fiery. But add the black undies, and the gold just glows. 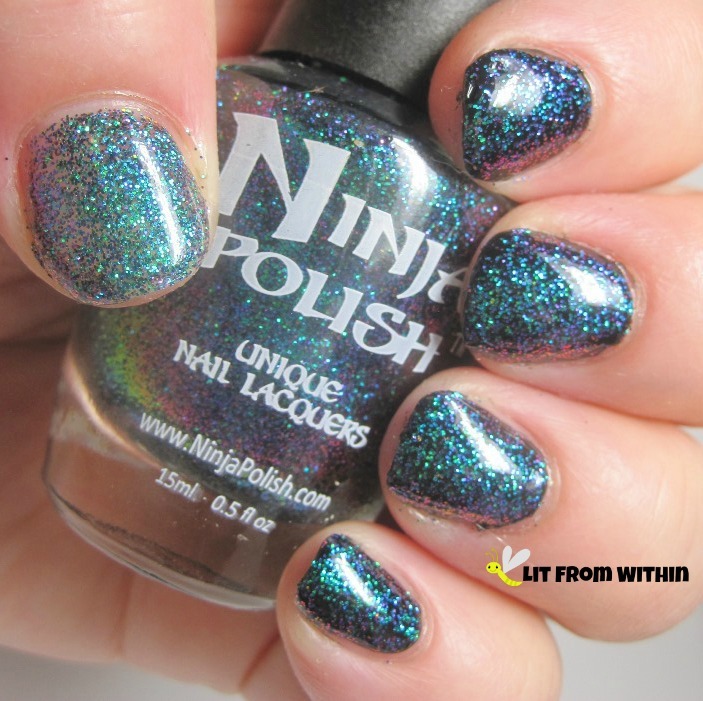 Hydra is a bright teal glitter, reminiscent of the sparkling waters this mythical dragon calls home. It shifts to a dark blue and bright purple. The teal almost disappears! Last, but not least, is Enter the Dragon. 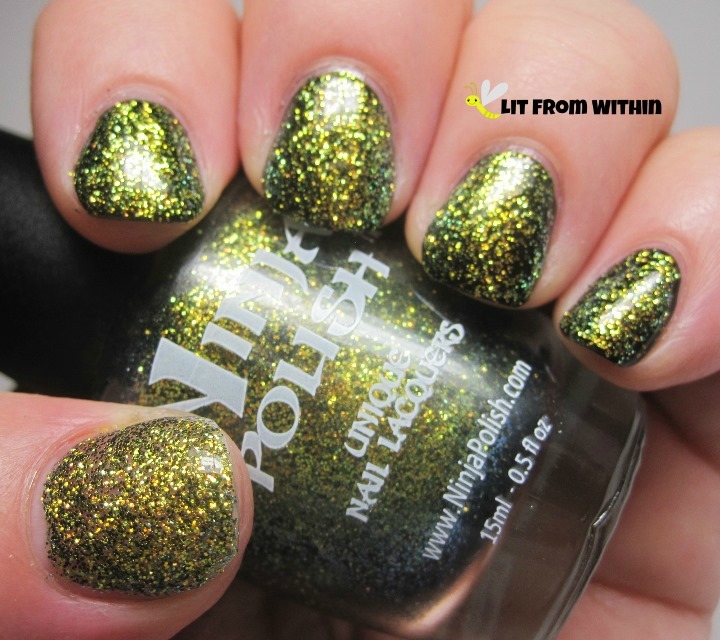 While not a dupe for the VHTF OPI Mad Hatter, it is a similar mix of micro glitters. To me, this polish looks like Mardi Gras on my nails. So many bright colors blending in and glittering together. Are you feeling the Dragon love? I really like them all, but my fave is Komodo. Chameleon is pretty unique, too! I love Ninja Polish stuff, and these are some of my new faves.